"Small race, big heart, festive atmosphere "
When a work commitment takes you out of state, what do you do? For me, it means looking to see what race options are available. Fortunately, a December weekend trip to Tampa brought me within a two-hour drive to Mount Dora, a vibrant, festive and eclectic community that happens to put on a half marathon and 5K the weekend I was in town. Due to work and travel commitments, I was not able to attend the expo of the Mount Dora Half Marathon. However, the race offered packet pickup on race morning. The pickup was held in a centralized indoor building in the heart of Mount Dora. It was easy to find and there was plenty of free parking nearby. It took me almost no time to get my bib and race shirt. Afterward, I got into my pre-race routine, relaxing and using the port-a-potties mostly. There were only five port-a-pots near the packet pickup. While I was waiting, another runner mentioned there were more near the “lake” — I was already close to the front so I didn’t inquire as to what she meant by the lake but I believe she meant the start/finish area, which was about a quarter-mile away. Race morning was a comfortable 50 degrees. (OK, comfortable for me. Some of the Floridians were freezing.) The pre-race festivities near the start line were energetic and helped give the roughly 2,000 half marathoners a positive vibe going into the start of the race, which was 7 a.m. The 5K runners would start 15 minutes later. I think I am starting to get the hang of this rolling hills thing. I set my half marathon PR on a course with rolling hills last month and I aimed to best that effort at Mount Dora. After all, this race not only concluded my race season, it was my fourth race in the last six weeks. That is by far the most I have done that close together but I had been recovering well. And the next race on my calendar was two months away, so why not go for it? Still, I wanted to be smart about my effort. As runners gathered for the start, I decided to set up behind the 1:40 pace group so that I would not go out too fast. I planned to do the first mile at an 8:30 pace, especially since the first quarter-mile was one of the four uphill sections. After that, if I felt good, I would aim for a 7:30 pace. The first mile clocked in around 8 minutes flat. I revved up my engines and settled in to a pace around 7:30, where I stayed fairly consistently until the final mile when I hit 7:10, my quickest mile. The course — which is very well marked and staffed more than adequately by volunteers — takes runners around downtown Mount Dora, through various neighborhoods and around its lake. As someone who is new to the area, there were plenty of things to see – festive shops, friendly residents and the serene lake. In fact, about midway through the race, a group of carolers serenaded the runners from a porch overlooking the course. 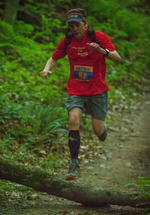 I felt really strong going up the final climb at Mile 12, feeling confident about at PR. I broke away from one runner and caught a second one as we crested the hill. I offered him a dose of encouragement and continued to push hard. With all the climbs of note behind me, I was greatly looking forward to the slight descent toward the finish. At this point, I knew that I would PR — the question would be by how much. As I re-entered downtown Mount Dora, it was fun to see the holiday-decorated stores in daylight. I made one final turn and headed to Santa and the finish line. Remember that quarter-mile climb at the beginning? That turns into a much-deserved quarter-mile descent at the finish. It was great to see the race director manning the PA system at the finish line, cheering runners in. It’s always fulfilling to hear the race announcer welcome you to the finish, especially when he raves about your hard pace and strong finish at the end. I crossed the line at 1:38:00, nearly two minutes faster than my previous PR set just over a month ago. Overall, I finished 45th out of more than 1,300 runners who had signed up. After crossing the finish line, runners received their medals and a bottle of water. Outside the finishers chute was a post-race area for celebrating, reuniting with family and friends, and cooling down. I really enjoyed my time at the Mount Dora half marathon. My only wish is that I was actually able to spend more time in Mount Dora. Due to my travel and work schedule, I drove in early race day and left shortly after the race. Even so I am really glad that I was able to participate in the race. It was executed perfectly on basically every level that matters to me. I may not find myself in central Florida again in mid-December. But if I do, I will be signing up for the Mount Dora half marathon again.